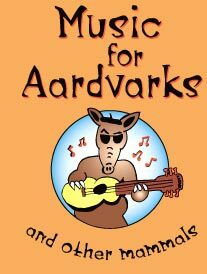 Music for Aardvarks is a groovy kids music class that both children and their adults look forward to. Each session features a wide variety of fun musical activities including singing, dancing, musical story-telling and instrumental jam sessions. The classes are centred around rockin' original music that incorporates influences from rock, pop, indie, folk and blues, and provides a fertile musical environment geared to the real lives of kids from 6 months to 5 years. Music for Aardvarks unique approach to kids music has been going great guns since it was launched in 1997 in New York City. And now for the first time it is available in the UK. Classes kicked off in Brighton in January 2006 and are a resounding hit with the kids on the coast! The UK Aardvarks classes are run by Emily Hilson, an experienced and enthusiastic group leader, piano teacher (ask for details), professional symphonic violist and Mother of two, who's fascinated with the positive effects of music on early child development. All the class details are listed below, but if the time or location don't work for you let us know — we are planning on rolling out other classes and locations throughout the year. Click Here to see a map of all our current class locations. FREE Trial Classes available (please book these in advance). Come along and see how you like it! Each term you take home to keep a new original CD to help you enjoy the cool new songs we'll sing in class. We promise by the end of term your whole family will know all the words to all the songs and be singing at home to your favourites! Each term you pay £14 for your accompanying CD and £5.50 per class. Classes follow a school term schedule. Siblings under 6 months are free. Siblings over 6 months are half price. Makeup classes are available. Contact Emily Hilson now to book your place!